An Indian Peace Delegation visited Pakistan from March 17-25, 2011. During their stay they visited Karachi, Hyderabad, Islamabad and Lahore. They met Pakistan Prime Minister Mr. Yusuf Reza Gilani, Sindh Chief Minister Mr. Syed Qaim Ali Shah, Senators of various political parties, civil society activists, journalists, members of business community, and students amongst others. 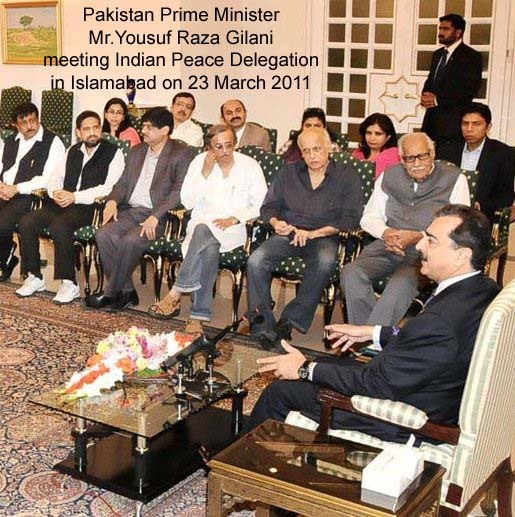 In his meeting with the Indian Peace delegation, Mr. Gilani, the Prime Minister of Pakistan stated that dialogue is the only way to make progress in India-Pakistan relations. He assured the Delegation that his government was fully committed to make the peace process work. He also expressed confidence that the meeting between Home Secretaries of the two countries in Delhi would yield results. He praised the role of civil society in promoting peace between India and Pakistan. Many members of both the house of Parliament (National Assembly and Senate) of Pakistan agreed that there is a need to form India-Pakistan Forum of Parliamentarians to address the outstanding issues between both the countries and the Indian Peace delegation along with members of Pakistan Peace Coalition have decided to work for the formation of such a Forum.. The members of the Delegation participated in many meetings, seminars and interactions in Karachi, Lahore, Hyderabad (Sindh) and Islamabad. The themes and concerns covered in these interactions were the need for uninterrupted and uninterruptible dialogue between India and Pakistan, release of all fishermen from the prison of each other’s countries, revival of India-Pakistan Judicial Committee on Prisoners, resolutions of water sharing disputes and opening up of trade for prosperity of both countries. There was a constant demand that Visa should be made easily available to members of divided families, artists, students, researchers, academics and peace activists to encourage greater people-to-people contact that alone could help normalize relations. As an immediate step, both the governments should extend the facility of visa on arrival to the senior citizens and children below 12 years as agreed between them earlier. It was also felt there is an immediate necessity of a joint mechanism against terrorism and a need to provide platform to common people to enable them to participate in foreign policy formulation that could reshape relations between the two countries from confrontation to cooperation and friendship. The Delegation also met the family members of Salman Taseer, Governor of Punjab, who was assassinated by his own security guard, for his principled position on Blasphemy Law. Mr. Taseer stood for basic values like human rights and minority rights. The Delegation offered its condolence at the unfortunate demise of Mr. Taseer and expressed their solidarity with his family. The team is back from Pakistan with a message of love and friendship. It is time that establishments in both India and Pakistan reciprocate the wishes of people of both the countries to address all outstanding issues. In fact, the issues of Siachen and Sir Creek can be resolved quickly as they were very close to signing the agreement when the Composite Dialogue was paused following the attacks on Mumbai. The visit received unprecedented coverage in the print and electronic media all over Pakistan. The 12-member Indian delegation was led by Mr. Kuldip Nayar (veteran journalist) and included Mr. Mahesh Bhatt (Film Personality), Mr. Bhalchandra Mungekar (Memeber, of Parliament) Mr. Shahid Siddiqui (Editor, Nai Duniya), Mr. Jatin Desai (FOCUS), Dr. Mazher Hussain (COVA), Ms. Kamla Bhasin (SANGAT), Mr. Ramesh Yadav (FRI), Mr.Sanjay Nahar (SARHAD), Mr. Haris Kidwai (Peace Activist), Mr. Y. Laxmi Prasad (Former MP) and Mr. A. Krishna Rao (Journalist).